Tucked away in the layers of paper that come with any loan agreement (especially those from the IMF) were arrangements that opened Ukraine to be raided by major corporations one of which is the nefarious Monsanto. Putin wisely kicked these peddlers of toxin out of Russia, yet traitors like Poroshenko and Yates open the doors to these bandits. Both these two Gestapo leaders came to power via a coup, which is illegal based on Ukraine’s constitution. Ukraine opens the gateway to other parts of Eastern Europe, but its land is one of the most prized in the world and allowing GMO food in will have a devastating effect on the ecosystem. In fact, Putin has openly stated that Monsanto’s Bee-killing products are enough reason for a nation to go to war. Ukraine is asking for even more trouble by embracing these corporate thieve. 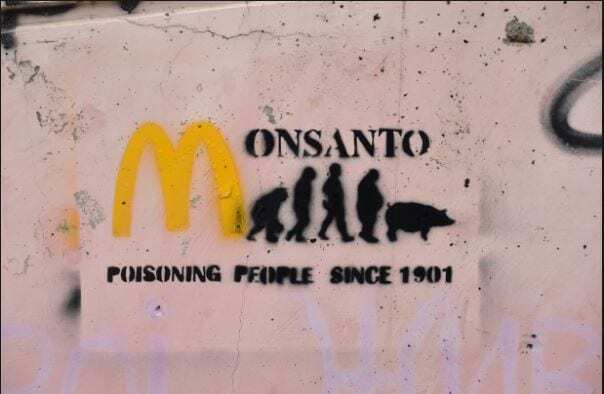 Oakland Institute a California-based organization recently released a report titled “Walking on the West Side” showing how the conniving World Bank and IMF pushed terms that would force Ukraine to open the Country to Genetically Modified Crops. Viktor Yanukovych, despite being a crook and gangster rejected the loan offer from for the $17 billion IMF loan. The world sadly is only coming to terms with this disaster now. Wisely for a chance, he opted for the Russian aid package worth $15 billion with an added incentive of cheaper Russian Natural gas. His change of heart is what pushed the Neo-Cons in Washington to mobilize and turn Maidan into a scene of violence and Bloodshed. According to the Oakland Institute, “Whereas Ukraine does not allow the use of genetically modified organisms (GMOs) in agriculture, Article 404 of the EU agreement, which relates to agriculture, includes a clause that has generally gone unnoticed: it indicates, among other things, that both parties will cooperate to extend the use of biotechnologies. Ukrainian constitution forbids farmers from GMO crops, but now with this insidious agreement, Ukraine’s pristine lands are going to be invaded.